I had seen this beer for a few years, but for reasons I can't explain, I was never really motivated to buy it. I think partially it was the size of the can and the fact that I could never find it in loose six pack bottles. But when I saw the loose can in Albany at Oliver's I took the plunge. The Dayblazer is an American Blonde Ale, which on the scale of beer education/growth is a few pegs above macrolager and not truly an ale. But that's not to say that it does not have redeeming qualities, or that you can't enjoy one on a hot summer's day after you finish tarring the roof (or doing a 13 mile bike ride). The beer poured a golden yellow with good foam retention and some hop scent, if not bite. Its low on the alcohol scale for an ale (4.8% abv) but the flavor is not as mild as a macrolager. Not that it held its own with the veal stew that I tried it with, but it would do well with pizza. So the bottom line is if you are looking for a hop forward ale with lots of citrus and pine, this beer is not for you...but then again no American Blonde Ale would be either. The New Belgium Dayblazer is under kosher supervision by the Scroll-K/Va'ad of Denver, but not every brew produced by New Belgium is under kosher supervision. 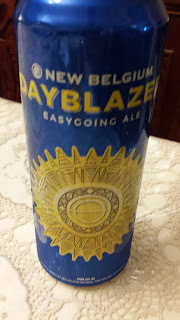 For a list of the New Belgium brews currently under supervision, please click on the link on the left side of my home page for my latest Kosher Beer List. To see what the experts on Beer Advocate think about The New Belgium Dayblazer Easygoing Ale, click here beeradvocate.com/beer/profile/192/262695.